The late T. Stokes was a veteran of British Intelligence who interviewed people close to Churchill. Winston Churchill was a Satanist, homosexual and alcoholic who took bribes and sold out his country to advance Rothschild’s Masonic Jewish world tyranny. 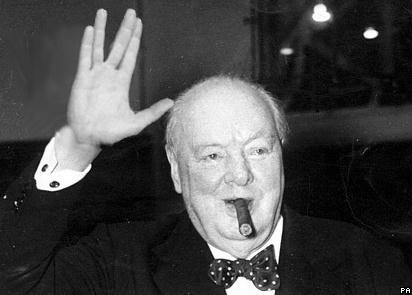 Winston Churchill who led Britain into two world wars with his famous “victory” salute is still revered by many people. In a recent rigged newspaper poll, he was voted Britain’s greatest Englishman. Churchill was a long-term Zionist puppet and served their interest before that of Britain. He was a Druid priest, a 33rd degree Mason and member of the Golden Dawn. Masonry is a secret elitist anti-democratic anti-Christian satanic cult. His “V” salute is a recognized greeting of the horned god, the symbol of the Devil worshipping Illuminati. The initial “V” is the 22nd letter in the alphabet, a sacred number in Hebrew numerology, and corresponds in the tarot pack to the major arcana. Winston changed sides in his political career four times. His skills were on offer on several more occasions for the right price. He was known in the House of Commons as ‘The Shithouse’ from his initials WC. He accepted £150,000 from the Rothschild’s bankers to bring Britain into W.W.II against Germany, and to drag in the USA. Archbishop Lang, the Church of England expert on occult subjects, prior to W.W.II was privy to Churchill’s putting together the “Black Team.” These were wartime astrologers, dowsers and ritual magicians, under the stewardship of Louis de Whol. Dennis Wheatley, Dion Fortune, Dr. Alexander Cannon and Ian Fleming all claimed that Churchill had wartime dealings with Aleister Crowley, and the famous East End spirit medium Joe Benjamin, who was often advertised in the sixties as, Winston’s favourite medium.